Key partners from the Bradford district have announced that they are working together to offer an all-inclusive Christmas initiative, called Sparkling Bradford. The Sparkling Bradford initiative has been developed by The Broadway Bradford, Visit Bradford, Bradford Council, Made in Bradford and the University of Bradford. Sparkling Bradford will encompass all of the season’s events and experiences, highlighting the district as a Christmas destination for people of the North this festive period. The poem was performed and recorded by local school students, Georgina Macdonald, 15; Willow Clapham, 12; Jessica Braddy, 11; and Charlotte Malin, eight; of Skipton and Sebastian Peters, 11; of Shipley to mark the start of the festivities. The video will be shared across social media, as well as appearing on big screens around the district. Sparkling Bradford events have been wrapped up in a Christmas brochure, to be delivered across the district in the coming weeks and features events from each corner of the district, including Alpaca Treks in Oxenhope to the Industrial Museum’s Victorian Christmas Market and Saltaire’s Living Advent Calendar. 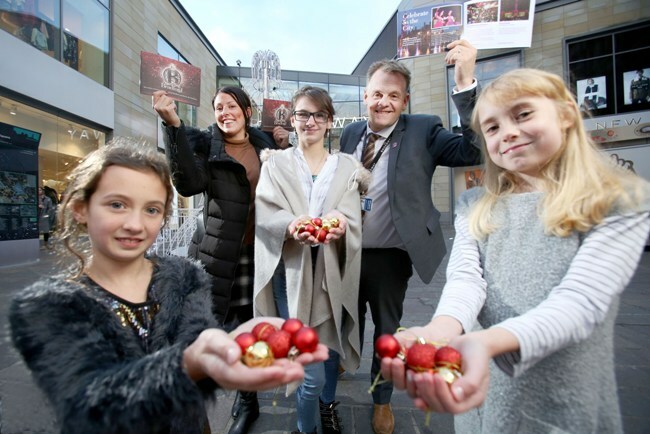 There will also be an opportunity to win £1000 worth of holiday vouchers, with a treasure hunt that takes visitors around the city centre in search of 12 Christmas baubles. Speaking of the initiative, Coun Sarah Ferriby, Bradford Council’s Executive Member for Healthy People and Places, said: “Sparkling Bradford is exactly what the district needs, it brings together all of the events that people love into one big Bradford Christmas.